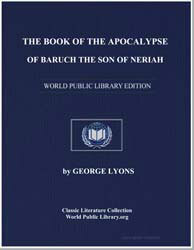 Excerpt: Announcement of the coming Destruction of Jerusalem to Baruch. And it came to pass in the twenty-fifth year of Jeconiah, king of Judah, that the word of the Lord came to Baruch, the son of Neriah, and said to him: 2 ?Have you seen all that this people are doing to Me, that the evils which these two tribes which remained have done are greater than (those of) the ten tribes which were carried away captive? 3 For the former tribes were forced by their kings to commit sin, but these two of themselves have been forcing and compelling their kings to commit sin. 4 For this reason, behold I bring evil upon this city, and upon its inhabitants, and it shall be removed from before Me for a time, and I will scatter this people among the Gentiles that they may do good to the Gentiles. And My people shall be chastened, and the time shall come when they will seek for the prosperity of their times.